Tim Marshall in his excellent book, ‘Prisoners of Geography’, underlines the importance and much overlooked influence of geography on the history of the world and modern geopolitics. Among many great examples, include Russia and it’s need for a warm sea port, or Europe, where terrain, climate and rivers created the multitude of countries and cultures in a relatively small land mass. Another example of historical and geography’s persisting impact today is perhaps no greater than in Africa, where colonialists drew lines on maps, with disregard for ethnic divisions, geography and history. One of many examples of this is the West African, former French colony of Mali. What is often forgotten from a ‘Western’ (European/American) perspective is that civilisation existed well before Europeans ‘discovered’ Africa; indeed it is where humanity first began. It is simple quirks of geography, climate, history, exploitation, and the shear size of Africa that meant nation states didn’t form naturally in Africa and that other parts of the world were technologically more advanced by the ‘colonialist’ era. The West of Africa was a great cradle of civilisation, -the medieval city of Timbuktu (Tomboktou) is well known, but existed as far back as the great Mali Empire of the 13th Century which once dominated the region (see maps above). The physical geography of what is now modern day Mali is an important consideration here – the Mali Empire stretched all the way to the far west to ports at the Atlantic Ocean, and the main settlements of Timbuktu, Bamako, Segou and Gao, formed along the Niger River. Throughout pre-colonial Mali, we can see that settlements and regional control of the Niger River was important. The Niger River and the relatively greener plains of ‘Sub Saharan’ Africa are in contrast to the Sahara, which continues the other side of this river, up until Algeria. 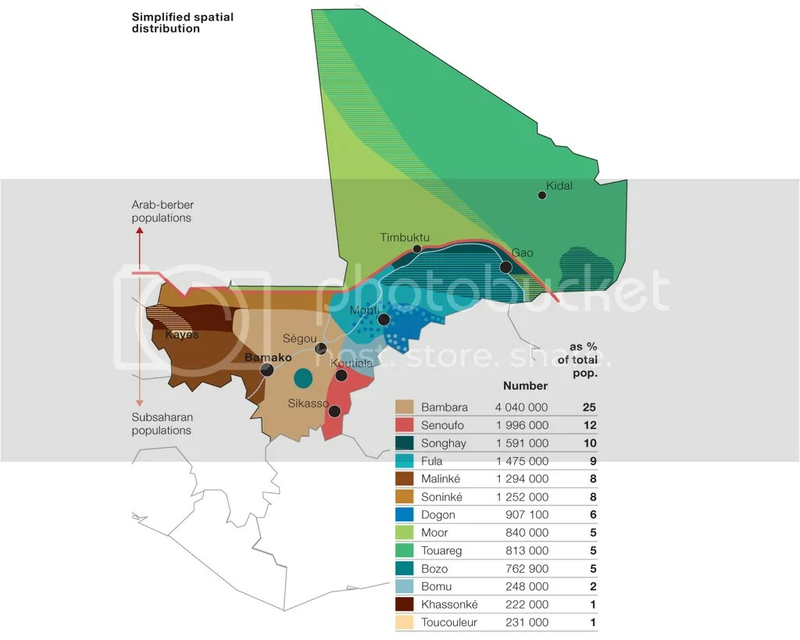 Here also lies cultural geographical differences – southern Malian history is shared between the Mali and Songhai Empires, where as Islamic Morocco, Tuareg and Berber populations have more history in the North (see historical map 1650AD). This geographical shaping of cultural history is important in looking into modern day struggles in Mali. 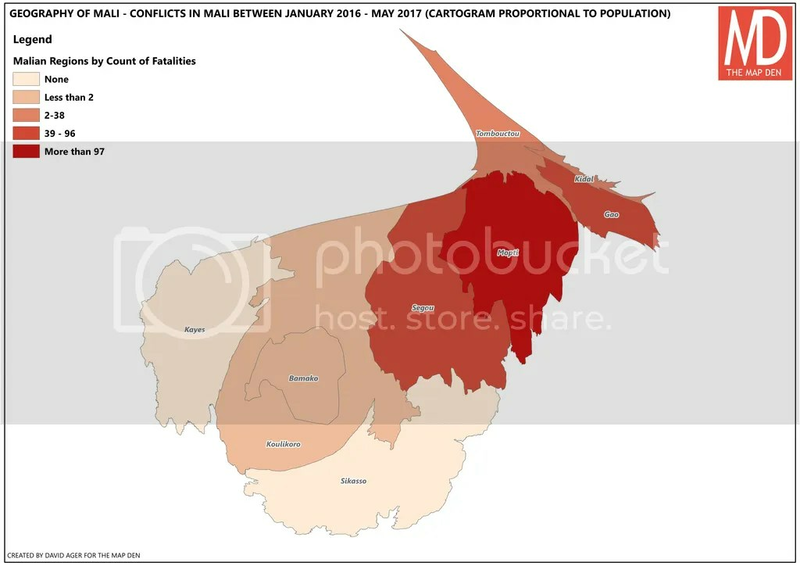 This is reflected in the earlier map of ethnic groups in Mali from the Guardian, where there is a north-south divide between Arab-Berber populations and Sub-Saharan populations like . One would suggest if one to draw a boundary line, it would be here – however colonialist lines were drawn differently and so these ethnic differences and conflict are played out, as in many African countries, within the artificially created nation state. This has resulted in internal conflicts, particularly in the north-eastern ‘Azwad’ region where the Tuareg peoples seek self-determination, this particularly flaring up in 2015. 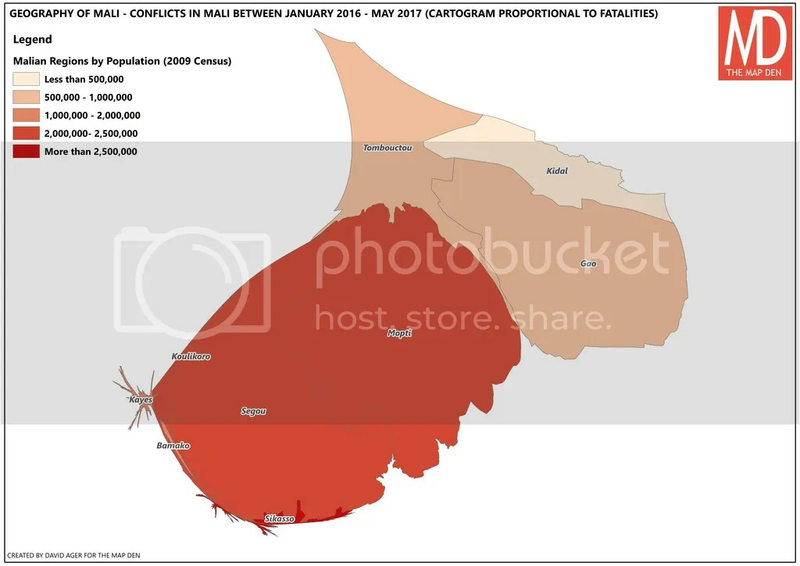 This can be seen in the above conflict maps and cartograms (see below) I have produced, where there is a relatively high number of casualties in an area of relatively low population. This area also is in the backdrop of modern global extreme Islamist ideology and terrorism. 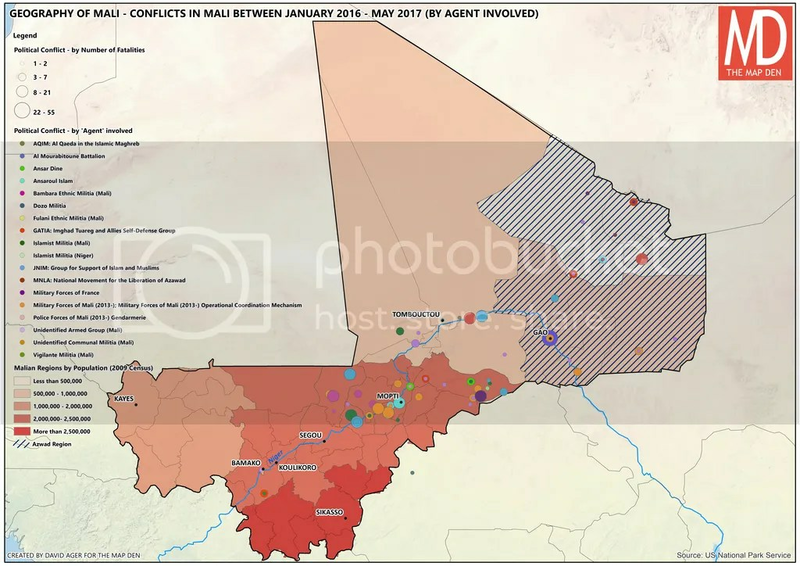 Mali is 90% Muslim (mainly Sunni), however there is struggle with Islamist militia in both the Northern region, but also in the Mopti and Segou areas of central Mali -the ‘neck’ of Mali, which is both populous and yet strangled by conflict. The northern region has come under Islamist influence back and forth, with the fights with French and Malian government forces, with strict Sharia law resulting in persecutions of minorities. This highlights how the ‘Sub-Saharan line’ which stretches across Mali is a ‘frontier’ between government and Islamist forces, Arab and Sub-Saharan Africa, ancient civilisations and nomadic peoples. Both historically and culturally, as well as geographically, has and remains to be a ‘frontier’. For those wanting a further insight into Malian culture and modern politics, the 2014 film Timbuktu is a great watch. 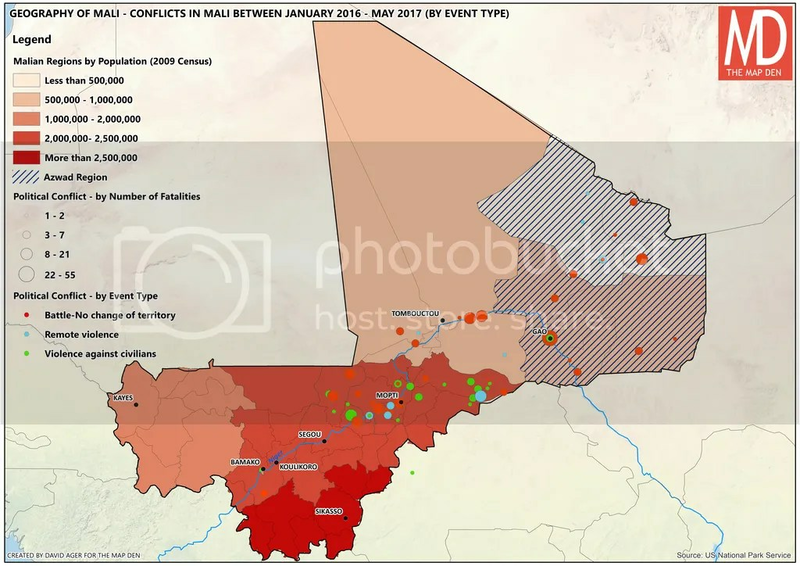 PS – Data credits for conflict maps go to ACLED which provide a great and vital resource in African Conflict data with great visualisations using Tableau, which I really encourage you to check out.